U.S. health regulators have warned parents and caregivers not to use these and other homeopathic teething products, which may be linked to hundreds of injuries and complications, including seizure and 10 infant deaths. The teething tablets and gels implicated in the adverse events may have contained inconsistent levels of a potentially toxic ingredient called belladonna. The nationwide law firm of Bernstein Liebhard LLP is now investigating injuries and deaths potentially associated with the use of Hyland’s and CVS-brand homeopathic teething pills and gels. If you would like to learn more about filing a teething tablets lawsuit, please contact our office by calling (888) 994-5118. Homeopathic Teething Medicines: What’s the Problem? The FDA disclosed that it was investigating adverse events reported to the agency regarding homeopathic teething medicines, including seizures in infants and children who were given these products. On October 12, 2016, a number of media outlets revealed that the FDA had received more than 400 injury reports, including 10 infant deaths, involving such products since 2010. Other problems reported in relation to homeopathic teething medicines included shortness of breath, vomiting, and constipation. The FDA did not identify any specific brands, and was careful to note that it had not yet conclusively determined if any of the products were directly responsible for the fatalities. The FDA has advised consumers to seek immediate medical attention if their child experiences seizures, difficulty breathing, lethargy, excessive sleepiness, muscle weakness, skin flushing, constipation, difficulty urinating, or agitation after using homeopathic teething tablets or gels. This not the first time the FDA has warned the public about homeopathic teething remedies. In 2010, Hyland’s agreed to voluntarily issue a teething tablet recall after is medications were tied to a number of adverse events, including seizures in infants and children. According to the FDA, the Hyland’s tablets contained inconsistent amounts of belladonna, an ingredient that can be toxic when ingested in large doses. The adverse event reports involving the tablets were consistent with belladonna toxicity. As of October 13, 2016, Hyland’s had not issued a second teething product recall. However, the company did announce that it would no longer distribute its homeopathic teething medications in the U.S. due to “confusion among parents and limited access to the medicines” created by the FDA’s most recent warning. CVS did announce that it would withdraw all homeopathic teething tablets and gels from its store shelves. Brands affected included Hyland’s, Baby Orajel Naturals and CVS store brands. The adverse events linked to homeopathic teething tablets and gels mimic symptoms of belladonna poisoning. Belladonna, aka deadly nightshade, is an herbal ingredient used in homeopathic medicines because of its sedative effect. However, excessive levels of the ingredient can be toxic, especially for children. “Atropa belladonna is a poisonous plant that can cause anticholinergic effects when ingested. Roots, leaves, and fruits of the plant contain the alkaloids atropine, hyoscyamine, and scopolamine, which can lead to an anticholinergic toxidrome; however, not all characteristics of the toxidrome are necessarily present in each case of poisoning,” the study abstract stated. April 13, 2017: Nearly four months after the FDA confirmed inconsistent amounts of belladonna in Hyland’s homeopathic teething remedies, the Standard Homeopathic Company agreed to recall the products. 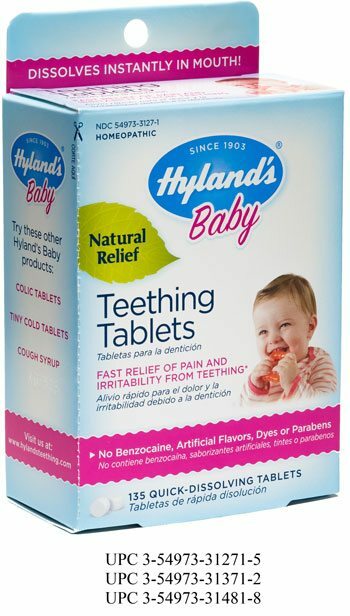 The recall includes all lots of Hyland’s Baby Teething Tablets and Hyland’s Baby Nighttime Teething Tablets. The FDA recommends that consumers stop using these products marketed by Hyland’s immediately, and dispose of any in their possession. 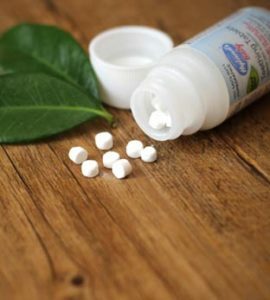 Since warning of the dangers associated with homeopathic teething tablets in September 2016, the FDA has cited some companies that manufactured the medications or their ingredients. In June 2017, Raritan Pharmaceuticals received an FDA Warning Letter in connection with its November 2016 teething tablets recall. The letter was sent after the agency’s inspection of Raritan’s New Jersey factory turned up shoddy testing and manufacturing processes. Two months later, Homeolabs USA, which supplied some of Raritan’s ingredients, was hit with its own FDA Warning Letter. New Mexico-based Nova Homeopathic received an FDA Warning Letter dated September 1, 2017, after an October 2016 inspection uncovered a number of safety violations. Nova Homeopathic markets Teething Complex, an oral liquid teething medication that contains the herbal ingredient belladonna. Homeopathy, or homeopathic medicine, is a medical practice based on the theory that the body has the ability to heal itself. Symptoms of an illness are normal responses of the body’s attempts to heal itself. “Like Cures Like”: The idea that administering a very small amount of the same substance that causes a patient’s illness will result in a cure. The more diluted the “active” ingredient, the greater its benefit. Some homeopathic remedies may be so diluted that the helpful ingredient is no longer even detectable. Despite the questions surrounding the effectiveness of homeopathic medicine, sales of such drug are climbing. U.S. consumers spent about $1.2 billion on homeopathic medications in 2014, an increase of 33% percent since 2000. Here, what to know before you buy. In February 2017, the U.S. Food & Trade Commission (FTC) announced a crackdown on false and misleading claims involving homeopathic medications. That homeopathic theories are not accepted by most modern medical experts. The European Academies Science Advisory Council (EASAC) has issued a 12-page statement in which it asserted that “promotion and use of homeopathic products risks significant harms”. Some Maryland parents became angry after samples of Hyland’s Homeopathic Hyland’s Cold ’n Cough Syrup were included in bags of treats distributed to students during the Lansdown School District’s annual “Trunk-or-Treat” Halloween celebration. Was Your Baby Hurt by a Homeopathic Teething Medicine? Contact an Attorney Today. Your family could be entitled to compensation if you child suffered serious complications following the use of a Hyland’s or CVS homeopathic teething medication. To obtain a free, no-obligation review of your potential teething tablet lawsuit, please contact Bernstein Liebhard LLP today by calling (888) 994-5118.